Why did Roland Hedley start tweeting again, and how can I read his stuff? In March, 2009, veteran correspondent Roland Hedley opened a Twitter account and began to tweet. A month later, a sampling of his 140-character missives was published in The New Yorker to great acclaim. The best of his work was published in 2009 as "My Shorts R Bunching. Thoughts?" : The Tweets of Roland Hedley, and he thereafter directed his efforts elsewhere. According to his recently reactivated Twitter account, Hedley is now the Trump Tweets Bureau Chief for Fox News. He can be read, and followed, here. I've loved your strip for decades, but I can't remember who Sal is. During his pre-college years, Mike's younger brother Benjy turned to the Punk side and adopted the moniker "Sal Putrid." Since Doonesbury has chronicled the adventures of Donald Trump for decades, could you please entertain us by revisiting his role in some of the previous presidential campaigns? I'd especially like to see the one where we get a glimpse of what the Trump White House itself would look like. Thanks! Doonesbury's Trump archive is indeed deep and rich, going back more than 25 years, and we are pleased to share this retrospective. I inherited the passion for Doonesbury from my father's comics, but I never got to know how Mike and Kim met. Can you please help me fill in this gap? Thank you very much. With pleasure. We take you back to Seattle in the winter of 1996, where a Steve Forbes campaign event provides the setting for a fortuitous encounter between two employees of Bernie's Byte Shack. Oddly enough I'm a Zeke fan, and I regret that in your skim through Doonesbury history you're skipped over some of his storylines. How about revisiting him meeting Joanie and Rick for the first time, and the book he "wrote" about his MIA employer, Uncle Duke. Can do? Can do and have done. There's no accounting for taste. Enjoy! A few weeks back you had J.J. showing up unexpectedly and her mom explaining why she had abandoned her and the Blowback section was all lit up about it. Because of the holidays I never got around to it till now, but I meant to write and suggest that you show us whatever old stuff you've got about when Joanie first showed up in Doonesbury. I for one would enjoy it. Thanks! Good idea. Let's start the New Year with a look back at September, 1972, when Mark and Mike were wrapping up their "Call Me When You Find America" tour. After numerous stops, including Washington, D.C., Miami, Disneyland, L.A., San Francisco, the Sierra Nevada, and Las Vegas, the duo were heading East when Joanie flagged them down. The rest is herstory. It was nice to see Roland don his Afghan garb again this week. He may be the weirdest member of the Doonesbury cast, and I sometimes wonder if over the course of his career the entire journalistic profession didn't actually remake itself in his sadly lacking image. My memory is that he has always been the way he is, but I'd love to see his earliest appearance in the strip if you would be so kind. It is our weird pleasure. Enter Roland Burton Hedley III, stage left. I enjoyed the FAQ a few months ago about Jimmy Thudpucker recording "Ginny's Song" for the Slade campaign. How about making an old music freak's day by also revisiting the session a little later that featured more studio time with real-life guitar player Jay Graydon? It's our pleasure to cue up the 1977 series you refer to, which ends with Jimmy reprising "I Do Believe," a song which was featured in 1976's animated Doonesbury Special and on the 1977 album Jimmy Thudpucker's Greatest hits. And here's a link to Mr. Graydon's web site. In addition to his own albums and live performing Graydon has been a prolific studio player. The Thudpucker sessions with the Walden West Rhythm Section are included in his astonishingly long list of recording gigs. Last week's strips -- with Mark and his dad at the reunion, and then Mark trying to interview his dad on the radio -- reminded me of how much head-butting those two did in the early years of the strip. In a lot of families back then things were pretty awful in that way, and the strip really captured it. I'd love it if you'd go back and give us some more of Mark and his old man not getting along. Thanks! Indeed, the going was almost never smooth between Slackmeyer par and Slackmeyer fil, who frequently found themselves plunging deeply into the generation crevasse. Here is a sampler. 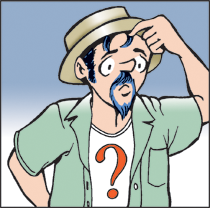 Is there a family tree available for the Doonesbury characters? I have trouble following who is related to who or divorced from who, or whom. Thanks. Indeed, it’s a lot of information to keep track of, and the web of relationships gets more complicated every year. We are happy to steer you toward three visual aids, starting with the 1991 Organizational Chart strip in which Sal and Mike wrestled with this very problem, noting “Aren’t most nineteenth-century Russian novels more comprehensible?” Five years later, on 5/26/96, Mike offered an updated version, which is temporarily unavailable in our online archive but appears on page 121 of The Bundled Doonesbury.